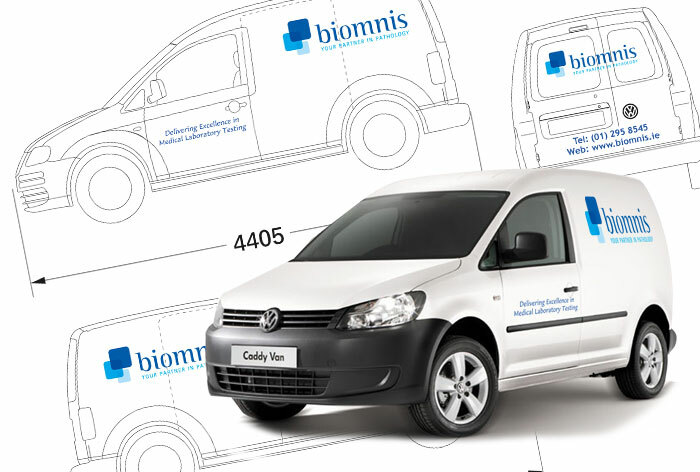 Vehicle Graphics are like moving advertising boards, with the huge benefit of a one off cost. It makes perfect sense to make your vehicles pay for themselves by contributing to your turnover with the most cost effective advertising that money can buy! Simply put, vehicle graphics is like having a sales team working for your business 24/7! 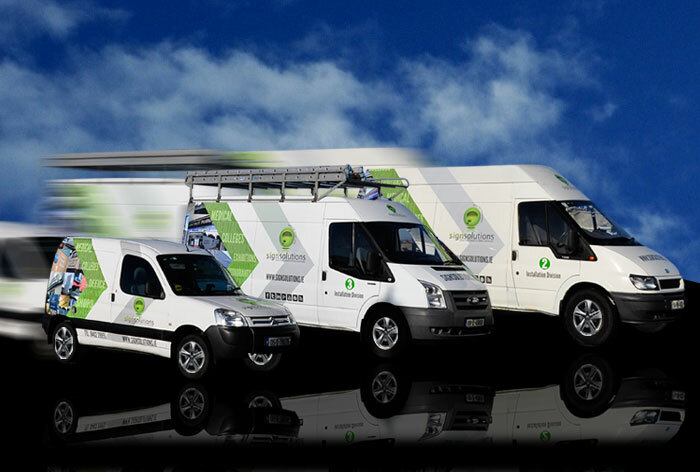 With well designed vehicle graphics, your truck, van, car, bus or trailer will attract new customers and generate huge awareness of your business, brand or service. Your brand and details must be visually eye catching, with a clear balance between branding, colour, placement and graphics. 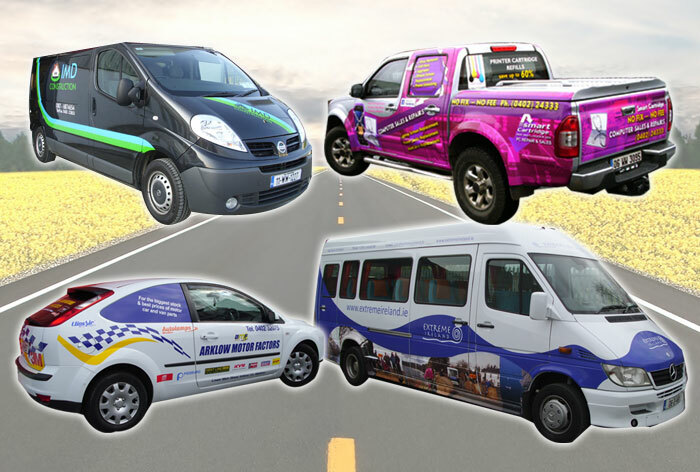 When considering vehicle graphics, it is highly recommended to work with a professional graphic designer with experience in vehicle graphic design as there are so many areas to consider such as vehicle dimensions, body contours, panels, windows and trims. At Sign Solutions, we have highly experienced graphic designers and fitters. If you do not have an existing logo or branding you would like to use, we design it for you. You can use this on your business cards or any other promotional material. We work closely with our clients taking a full brief of the job and our highly trained graphic designers will produce your design and email you for approval. We can revise or tweak the design to ensure you are completely satisfied with the results. What kind of Vehicle Graphics should I choose? There are many different options and there is something to suit every budget. Here are the different options and images. Half and Partial Vehicle Wraps : Half and partial vehicle wraps are a great way to use both the effectiveness of a custom design, with the head turning capabilities of images of full colour. Vehicle Window Graphics or Contravision can be used in conjunction with either a partial wrap and can range from standard white vinyl letters, to perforated vinyl with imaging. Perforated vinyl is a way to create an attractive design with full colour printed graphics, applied to any window of the vehicle. With this material you can actually see out of the windows and on the outside, your design is visible for all to see! Computer Cut Vinyl Vehicle Graphics : This option offers fantastic results through clever design. Vinyls come in hundreds of colours and smooth areas can be wrapped to achieve blocks of colour if required, with lettering or logos placed on top. This is an excellent option for businesses and the design can be tailored to suit every budget. Whatever option you choose, it’s important to remember that you need to let your potential customers now noticing you, how to contact you, what you do and where you are. Placement of your phone number, address and website are very important. Here is what’s important to display in your vehicle branding. Your business logo or brand, so that people will make a visual association with your business and recognise your brand wherever else it shows. Your phone number and contact details. The fastest way to get a return on your investment is to receive a phone call, email or for people to call to your business. Your list of product or services, as briefly as possible. Less is more! Call our team today to discuss you options.